A loss of appetite in older people is never a good sign, and it’s often an indication that there’s an underlying issue. Addressing the appetite loss could be as simple as changing a medication with bad side effects or taking your senior loved one to the dentist for some repair work, but in some cases it may be a symptom of a more serious disease or condition. Either way, it’s important to do what you can to get your loved one to eat, including consulting with a doctor. However, there are some great foods you can offer your loved one that may stimulate his or her appetite. One of the easiest ways to ensure seniors get many of the nutrients needed for daily living is to make a smoothie or milkshake. The idea of drinking rather than eating may be more appealing, especially if your loved one has a dental disorder or other issue with the mouth, throat, or stomach. The best thing about making a smoothie is that you can add all sorts of fruits, vegetables, and high-calcium dairy products to it. Nutritious soups are another option that may appeal to seniors who have difficulty chewing and swallowing. Avoid soups with big chunks of meat or vegetables, or consider pureeing them. Don’t be afraid to spice the soup up with your loved one’s favorite flavors. It may be necessary to start with a simple broth. Some medications cause food to taste bland and unappealing. If your loved one is up for it, add plenty of extra spice and seasoning to his or her meals. 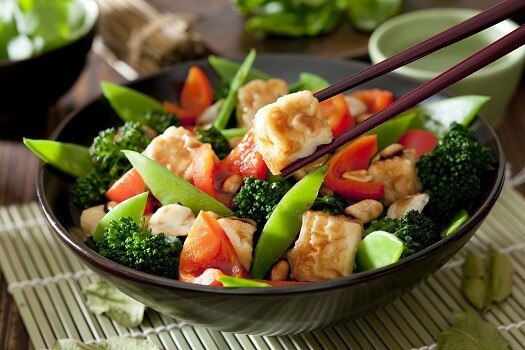 Experiment by steaming vegetables and spicing them up before serving them. Steaming makes them softer and easier to eat. Meal prep is just one of many tasks seniors may need help with as they age. If your aging loved one needs occasional help with bathing, grooming, cooking, or other basic household tasks, or if you need time to attend to important personal matters, reach out to Home Care Assistance, a leading provider of live-in and respite care. Rhode Island seniors can maintain their independence while living at home with the help of our reliable respite caregivers. If your loved one can drink alcohol, you may want to give him or her single glass of wine. Wine contains antioxidants, and studies have shown that alcohol is a natural appetite stimulant. Serve a glass before dinner, and your loved one may be more tempted to try what’s on the table. Foods that are easy to grab and eat without utensils or preparation may encourage your loved one to eat more, especially if he or she is living with a disease like Alzheimer’s or Parkinson’s. Keep some string cheese in the fridge, in a variety of flavors. Like milk, make sure you buy full-fat string cheese, as it’s more filling and provides the daily amount of protein and calcium. There are many reasons seniors might need assistance at home. Some may require regular mental stimulation due to an Alzheimer’s diagnosis, while others might only need part-time assistance with exercise and basic household tasks. Home Care Assistance is a leading Rhode Island senior home care provider. Families rely on our expertly trained caregivers to help their senior loved ones maintain a high quality of life. Peanut butter, almond butter, and cashew butter are just some of the great nut butter options. Try serving a nut butter alone or adding it to yogurt, smoothies, or crackers. Nut butters are filling and delicious and are filled with vitamins, magnesium, and other things your loved one needs for a healthy body. Keeping fruit on hand is a good way to help seniors who don’t have the ability to use utensils or prepare food on the stove. Fruit can be part of a healthy snack or meal, and because most fruit has high water content, it can provide hydration for seniors who don’t drink enough water. Most fruit is also easy to chew and swallow, and the sweet flavor yet lightness of the food may make it more appealing to seniors who don’t want to eat something heavy. Best of all, most fruits are filled with the antioxidants, vitamins, and minerals your loved one needs for a healthy life. Eating nutrient-dense foods helps seniors live a healthy lifestyle. If your elderly loved one needs help maintaining a high quality of life while aging in place, reach out to Home Care Assistance, a trusted provider of Rhode Island home care. Our caregivers provide transportation to and from medical appointments and social events, nutritious meal preparation, assistance with daily exercise, and help with everyday tasks like bathing, grooming, and light housekeeping. To learn more about our premier home care plans, call (401) 284-0979 today.